Rob Cesternino and Akiva Wienerkur never let their world’s collide, ensuring to bring you a Seinfeld podcast each and every week. 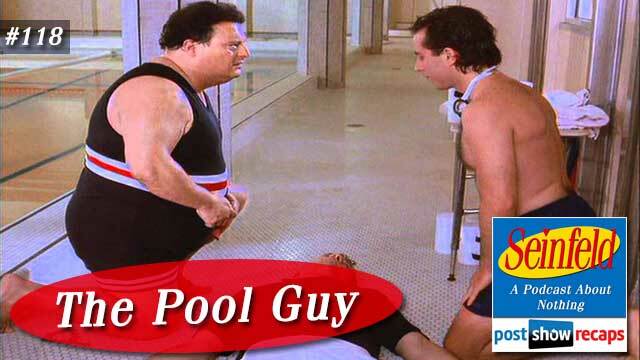 This time they discuss “The Pool Guy”, which first aired November 16, 1995 as part of season seven, and was written by David Mandel. News – There was a small bit of news in the Seinfeld universe this week. Akiva brought up how there are some Seinfeld “spec” scripts floating around out there, and one was sent to Akiva, where the plot was about 9-11. Akiva thought it was a bit racy, so he didn’t talk too much about it. Jerry’s Story – Jerry reluctantly makes friends with the pool guy named Ramon at his new health club. When Ramon is fired from the job, he inserts himself into Jerry’s life, leading to Jerry having to tell Ramon he has enough friends. When Ramon is rehired by the club, he harasses Jerry at every opportunity, even poking Jerry with the pool skimmer. Jerry yanks on the skimmer, causing Ramon to fall into the pool and get knocked out when Newman cannon balls onto him. Neither Jerry nor Newman will give Ramon mouth to mouth resuscitation, so they both have their membership revoked. Elaine’s Story – Elaine is looking for someone to go to an old clothes exhibit when Jerry suggests she ask Susan. When the two hit it off, Susan soon becomes part of the gang, even taking George’s spot at Monk’s, leading him to have to eat alone at Reggie’s. The friendship comes to an end when Susan gets annoyed by Elaine and Jerry talking throughout a movie, leading her to realize all these four do is sit around and talk. George’s Story – George is incensed when Elaine starts to hang out with Susan, feeling like his “worlds are colliding”. When Susan starts using some of their phrases and eventually takes his seat at Monk’s, he gets Jerry to understand his plight. Fortunately for him, the gang’s antics turn Susan off, and balance restores to his worlds. Kramer’s Story – Kramer gets a new phone number, which happens to be one number off the movie phone line. He spends much of the episode fielding calls, eventually starting to help the callers figure out where their movie is playing. The episode ends with the real voice of Movie Phone banging on Kramer’s door, wanting Kramer to stop stealing his business. Grades and Rankings – Akiva was generally up on the performances this episode. He thought Kramer, Elaine and George all deserved an A. Jerry on the other hand received a D-, as both he and Rob felt the pool guy storyline was really weak. Because of the weak Jerry plot, this potential top ten episode falls way down the list to number 63. Rob thought it was a bit low. Emails – Johnny De Silveira noted that this episode won a WGA award for writing. He also wondered why Jerry wouldn’t have given up his seat to George at the coffee shop when he noticed he was so upset over Susan being there. Lindsay asked where the lifeguard was at this health club of Jerry’s. Rob and Akiva agreed that this made for a bad club. Liz wondered why George was planning to never have his soon to be wife interact with his best friends, feeling that independence is for single people. Rob and Akiva disagreed, noting that it remains important well after being married. She also noted that mouth to mouth is no longer a method of resuscitation, and that it is solely done with chest compressions now. Hunter asked if the moral of the episode is to not make new friends, to which Rob and Akiva noted that Jerry has been preaching this since the early episodes. Roger weighed in on his thoughts of who would win in a fight between all the core four. He thought Kramer would beat George and Jerry because he’s shadier and would lose to Elaine because he has a soft spot for her. He thought Elaine would lose to Jerry because of old feelings for her, but would defeat George. Rob and Akiva agreed for the most part. Caleb asked how much the guys would have to be paid to see an exhibit about old clothes. Akiva thought he could do it for a decent sum, as long as it didn’t interfere with something more important and he didn’t have to be there for too long. Dan the benefactor wondered what kind of job specific sign offs they would use. After bandying about a few ideas, the guys decided it would be too ridiculous. Amir wrote in confirming that his blind date with Akiva wouldn’t have happened if the Mets game were just a regular game. He also thought Ramon would have made a good witness in the finale in the case against the core four. Chester closed things out by asking how Ramon could be fired for putting too much chlorine in the pool, but didn’t for harassing members. The guys thought with the lax lifeguard situation helps prove why this happened. He also noted that George was supposed to go to the Paragon Theater, but he was clearly at a different theater in Mid Town. Lastly, he added it was strange that Susan wasn’t mad about George trying to keep him from befriending the gang. Tune in next week as the guys will recap “The Sponge”. Send in your questions by emailing [email protected]. Don’t forget to subscribe to the podcast by going to postshowrecaps.com/seinfeldITunes where you can rate and review the podcast. You can get a discussion going about the podcast by leaving a comment on the show page, and as always, you can follow them on Twitter @robcesternino and @keev26. Special thanks to Mike Moore for writing up this week’s summary.